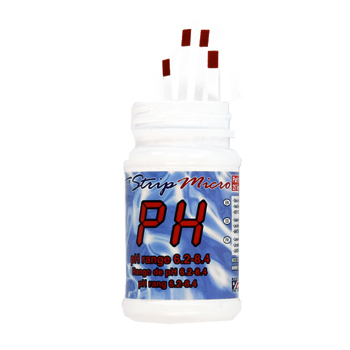 So, if you have a need to test pool water and don’t know where to get hold of a basic pool water test kit or replacement reagents, definitely stop by the Pool Water Test Kit Store. We run the place so, um, well, we KNOW the products work well! Today’s inquiry came to us from ‘Kishore’ who asked a question about a liquid test reagent that turned yellow when added to a sample of water containing chlorine-based water disinfection tablets. Dear Sir, I mixed chlorine tablets(water purification Tablets) in water. my friend taken water in Test tube. mixed one drop of liquid then water color changed in yellow. what is name of that liquid. how to by that.please can sent details. Hello, Kishore, and thank you for the inquiry about a liquid test reagent that turns yellow in the presence of chlorine. Based upon your description we suspect your friend used a chemical called ‘OTO‘ to perform the testing. OTO stands for Orthotolidine Dihydrochloride. It test for total chlorine (free chlorine plus combined chlorine collectively). 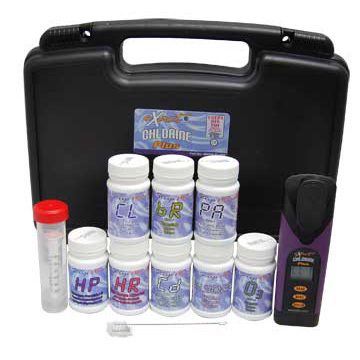 You can find OTO in most pool supply stores, as it normally comes in the more basic pool water testing kits for total chlorine and pH, the two most commonly tested pool water quality parameters. Many companies, including our own online store, also sell OTO & Phenol Red separately since they do tend to ‘go bad’ after a year once opened and exposed to air. 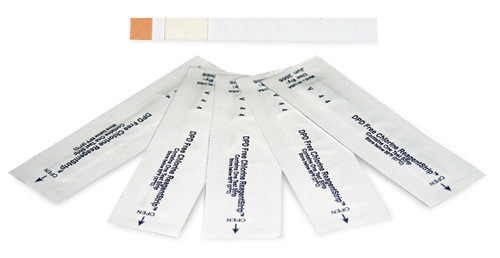 For an even simpler means of testing the chlorine levels in water samples you may want to consider a product such as the SenSafe Free Chlorine Water Check, an EPA Approved method for determining free chlorine concentrations in drinking water, or the WaterWorks 2 Free & Total Chlorine product that uses the same free chlorine testing method as the SenSafe Free Chlorine Water Check and also includes a separate test area for total chlorine. Want to know more about the differences between free and total chlorine? Check out an article called Free Chlorine, Combined Chlorine, Total Chlorine. One more thing about OTO before we go: We have heard that some countries have outlawed its use due to scientists having evidence that it may cause cancer in humans… so check local laws before making a purchase! I need to purchase a quick test means to locate water leaks in supply pipes to my residential water service meter. The county water uses a small tear able foil packet of chemicals that turns red when mixed with chlorinated water. My home has very low water pressure and volume, we are serviced by an extremely old and much damaged 2″ pvc line serviced by the Logan County PSD, Logan WV. The PSD does not have the time or personnel to investigate all of the water puddles located in the community where I live. I would like to be able to quickly and safely test any ground water in the hope of finding where the line rupture is. Thank you, Michael, for this inquiry. From the sounds of things your local water department uses DPD powder pillows or tablets to investigate the nature of puddles suspected to have formed as a result of leaks in municipal water lines. The chemical DPD turns various shades of pink through dark red in the presence of oxidizers such as chlorine, bromine, ozone, etc. Where can the average citizen get DPD? Chemical supply houses often carry DPD powder and/or tablets in bulk and many swimming pool stores tend to carry DPD powder pillows and tablets intended to work with swimming pool test kits. For what you want to do, though, we suggest you look more closely at DPD powder. Specifically we think you should focus your acquisition efforts on DPD-4, a compound which will detect both free chlorine and combined chlorine in a water sample. This matters because once water treated with free chlorine exits a controlled environment (i.e. leaves the pipe through a crack, fissure, etc.) the free chlorine will immediately begin acting on any and everything in its environment… and that will result in only combined chlorine possibly reaching the surface and creating a pool of water. Problems with testing puddles for chlorine? While not totally impossible that a pool of chlorinated water could potentially wind up on the surface over or near a leak from a chlorinated municipal water line, we believe that only a good sized leak could produce water in the volume required to get water containing highly reactive chlorine molecules through contaminant filled soil and up to the surface — with readable/detectable chlorine residual levels high enough to detect visually (or with a portable meter) using DPD. But, since your local water department does it, either your water line infrastructure routinely has large leaks or its water lines lie very close to the surface. Either way, a swimming pool supply company called In the Swim carries DPD-1 tablets and DPD-3 tablets. Crushing (carefully) and then mixing them (carefully) in equal parts should enable you to create your own version of DPD-4, but to play it safe we suggest using the appropriate amount of DPD-1 in a 10 mL sample of water and then using the DPD-3 in that same sample — per the ‘accepted’ procedures for free and total chlorine concentration determination. Seemed odd at first (several years ago), but after getting asked the same thing so many times we eventually came to the conclusion that a good number of people really and truly don’t know what questions they ought to have about the quality of their drinking water. In no way does the above list begin to scratch the surface of what curious folks read on our site, but it may help you decide what questions YOU want answered… and if you come up with a question or topic you’d like us to address, send it to us using our submit a comment/question form. It did, however, kind of shock us that hydraulic fracturing (aka: fracking), a means of extracting natural gas from shale buried deep beneath the Earth’s surface, came in so low on the list given the amount of (bad) publicity hydraulic fracturing has received in the past few years. We also found it somewhat odd that bacteria in water did not make a single appearance in the list but then again, most folks in the United States have city/municipal water and make the assumption that city/municipal water couldn’t ever contain something as common as bacteria — and that, friends, can sometimes become a dangerous assumption to make! Chlorine Testing Meter for Swimming Pool? hope you will be fine.i need some information regarding digital chlorine tester for swimming pool water .i read about extech cl200 testing metre.kindly send me the literature and price for it . Now before any of you go and criticize this person’s grammatical skills when typing in English, think more about the person’s commitment to keeping a proper chlorine level in swimming pool and the time it took to submit a question to this site. WE commend ‘Farhan’ for his/her efforts and for transcending the language barrier to ask a question about proper chlorine testing in pool water. On the topic of the “Extech 1200C” for chlorine testing in pool water, we took a look at the ExTech web site and did not find a meter in the chlorine/fluoride in water detection called the ‘Extech 1200C’… so we found ourselves a bit puzzled by your question. 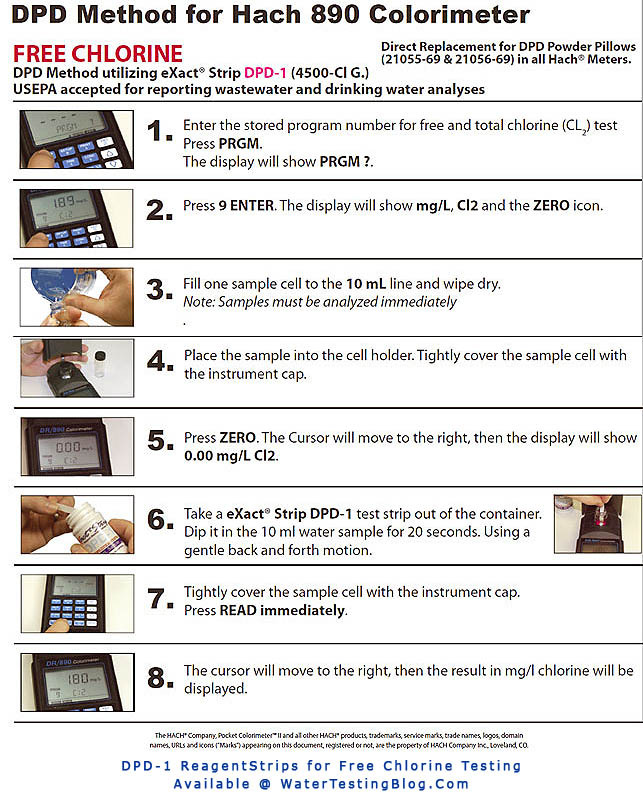 We DID, however, see the ExTech CL200 Chlorine Testing Meter which uses Extech (CL203) Exstik ExTab™ Chlorine Reagent Tablets, a undoubtedly a proprietary blend of DPD-1 & DPD-3 reagents, to test for ONLY total chlorine concentrations in water. The obvious problem we see with this meter for pool water testing, despite its USEPA credentials for total chlorine testing (in waste water), deal with the meter’s INability to test for free chlorine concentrations in water. Proper Pool Water Testing Requires Free AND Total Chlorine Testing! That heading said it all. Proper pool water care requires both free AND total chlorine testing. Why? Quite simply, it does little good for the sanitation of a pool to have an in-range total chlorine reading with a very low, or non-existent, free chlorine reading. When that happens the pool contains mostly, if not entirely, chloramines (aka: combined/used chlorine molecules) which possess very little (limited) oxidizing power… and limited oxidizing power means limited sanitizing capabilities. Improperly sanitized pool water can EASILY become a home in which various bacteria, parasites and viral ‘issues’ which will flourish, breed and infect swimmers if left unchecked. Invest in a meter that test for both total chlorine concentrations AND free chlorine concentrations. We suggest using a meter like the eXact Micro 7+ Pool & Spa Meter because it tests for not only free AND total chlorine, but also for Total Alkalinity, Bromine, Calcium Hardness, Copper, Ozone, Permanganate, and pH… all with the same meter! Earlier we talked about the Extech’s USEPA credentials so naturally we figure you want to know if the eXact Micro 7+ Meter has credentials, too — and it does! 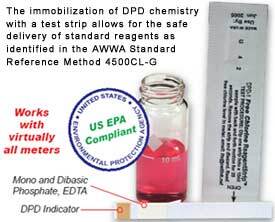 When used with DPD chemistry (and the appropriate procedures, of course) the meter qualifies as an EPA Compliant device for testing free an total chlorine in drinking water. 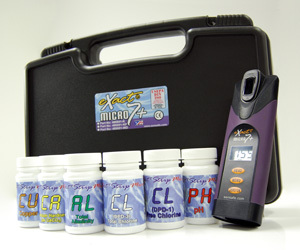 As an added bonus, the eXact Micro 7+ Pool Meter also has the ability to test for Ammonia, Chloride/Salt, Chlorine Dioxide, Chromium Hexavalent, Cyanuric Acid, Iodine, Iron, Low Range Total Hardness, Manganese, Nitrate, Nitrite, Acid pH, Alkali pH, Potassium, Sulfate, Sulfide, and Turbidity — when operated in ‘% Transmission’ mode with the appropriate eXact Micro 7+ Reagent Strips.